So my dad was in town and we met him for dinner last night and I thought I should take advantage of his I phone while we were with him because we still don't have a camera or a computer. So this is the best pic I could get for now. I think we have found a new place and things look okay for getting out of our lease. The worst is that we will loose our security deposit. But since my last post we found out that our renters insurance will only cover $2,500 which will only pretty much cover dan's work laptop and all the software that was on it. Oh well...who needs a computer or a wedding ring anyway? Within the last week I have had many people comment on my belly which I'm still getting use to. It's nice though that I actually look pregnant and not just have a wider midsection. The first lady to ever say anything to me was at the pharmacy and she said oh how many months are you 3? I'm already starting to feel like there is no more room for the baby. I don't know how everyone gets so big. It seems like it's impossible for your body. 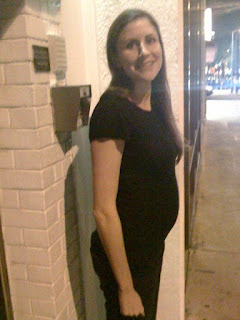 We are super busy until the baby comes which will hopefully make the time fly by. We are going to Vegas next weekend with some friends from the ward, and then Chandler will visit for a week. After will be my baby shower so the fam will be in town and then Nichole comes the next week. Not to mention moving sometime in between. I'll post some better pictures when I get a chance!! So it's about time to post some more pics but it's going to be a while longer. Dan's parents came into town this weekend and we went to pick them up Friday night at the airport. When we got home I opened the apartment door and found that it was unlocked. I kept saying that it was soo weird because I specifically remember Dan locking the door. We never leave it unlocked. I went into my room and saw all of my purses dumped out all over the floor and I knew right away what had happened. The first thing I did was run to where I had left my wedding ring. It was GONE! I knew it would have been. We had just gone to the gym before the airport and I never wear them to workout. They also got our laptop with all of our pictures, our new camera, Dan's work laptop, the xbox, and two cell phones. That's all that we have found missing so far. We luckily have renters insurance but I think they won't pay much back for jewelry. Dan says we will no longer live in this apartment so he's trying to get out of our lease. We need a more secure building. The funny thing is we picked this place because my relief society president has lived there for like 10 years and said it was very safe. I guess that means one more move before the baby is born which I'm not looking forward to at all!! I'll post a pic of me sometime but it will be hard with no camera or computer. I had my 28 week appointment last week and my uterus is measuring way small so they think she will be a little baby. Hopefully she will put on some pounds in these last couple of months!